A tourist found with a stun gun, knuckledusters and a baton in his luggage has been jailed for 32 months. 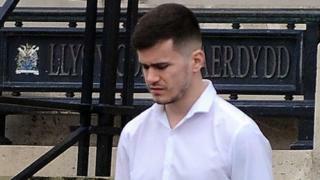 Jordan Williams, 23, from Barry, was returning to the UK after a family holiday in Bulgaria and was stopped by customs officers at Cardiff Airport. The stun gun was disguised as a torch and was capable of discharging 7,900 volts, Cardiff Crown Court heard. Williams pleaded guilty to possession of a firearm disguised as another object. He also pleaded guilty to three counts of possessing an offensive weapon in a public place. The court heard he had been on holiday with his child and girlfriend and was stopped when flight officials discovered the weapons in his luggage. When questioned at the airport, he said he had bought the weapons to display in a case alongside a collection of machetes and samurai swords. Nuhu Gobir, prosecuting, said: "Williams said he did not know these items were illegal in the UK and he had seen a sign in the shop he bought them from which said he could bring them back to the UK as long as they were stored in a suitcase. "He said he would have kept them in a locked display at his property and would not have used them for violence." Meirion Davies, defending, said: "He made full admissions and the torch was contained in its package." He added that in Bulgaria the weapons were considered lawful. Judge Michael Fitton ordered for the weapons to be destroyed. He told Williams: "The stun gun was in its box and it had 'police' written on it. It had an output of up to 8,000 volts and was in full working order." He said he accepted that Williams intended to display them and said other items such as the samurai sword had since been taken to the tip and recycled.